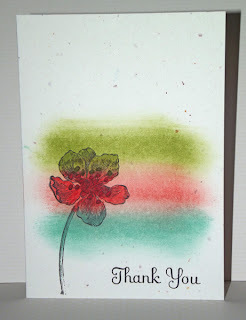 Just wanted to share with a a very quick "Thank You" card that I did for my lovely upline Sarah-Jane. She had sent me a card and gift as a little Valentine's treat, so obviously a "Thank You" card was in order. 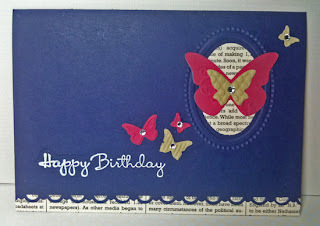 This type of card is really quick and easy to make. 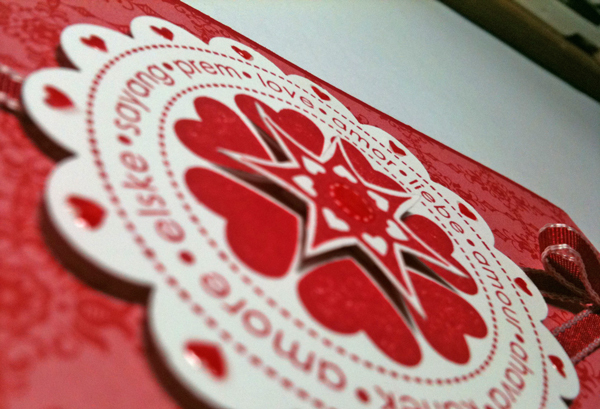 Basically you drag colour across the card and stamp over an image using StazOn ink. 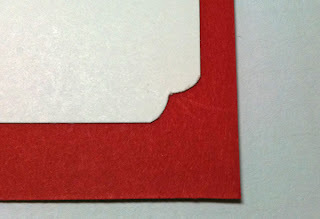 You can either use sponges, water colour pens or maybe even use the ink pads directly on the cardstock, any medium that you want to try to get that colour across the card. On this card I also added more colour on the flower image to enhance it, but you don't need to do this, I just wanted to make the flower stand out a little more. Stamp Sets : "Everything Eleanor"
Card stock : "Confetti White"
Colour : StazOn Ink, "Pool Party"; "Lucky Limeade" & "Calypso Coral"
Hope you haven't had too much snow where you are, it's nearly all gone where I am, which is a shame, I do like that "snowed-in" feeling, but that doesn't happen very often where I live :o/ Whether you like snow or not, it's great weather for staying in and crafting ~ yay! 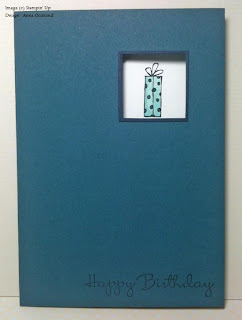 My share today is another, very simple, male birthday card. 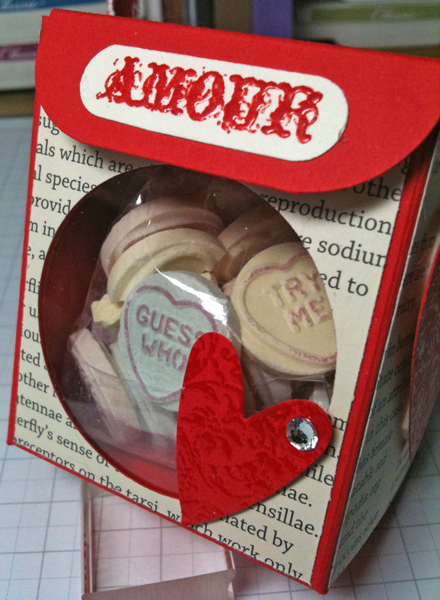 I actually made this one a couple of weeks ago, but as I sent it out this week, I didn't want to blog it until I was sure that the recipient had received it. 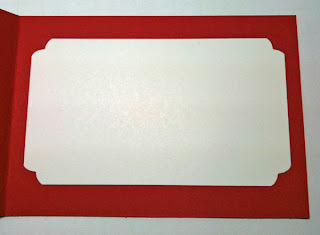 I punched out a square using the smaller square punch in a "Not Quite Navy" card blank then did the same in a scrap of "Night of Navy" cardstock, then used the bigger square punch over the whole I had made in order to punch out a thin frame which I glued around the aperture. I adhered some "Whisper White" cardstock inside the card, lined up the image so that it would peep through the hole perfectly, stamped with StazOn and coloured in with markers. All that was left to do was stamp the sentiment on the front, all together a very simple card that can easily be adapted for female and childrens cards, you just have to change the colour and image. Stamp Sets : "Every Little Bit" & "Happiest Birthday Wishes"
Card stock : "Not Quite Navy", "Night of Navy" & "Whisper White"
Another frustrating day with my internet connection dying, but I do just want to quickly share another Valentine's project with you before it goes again! It's a little treat box with handle. 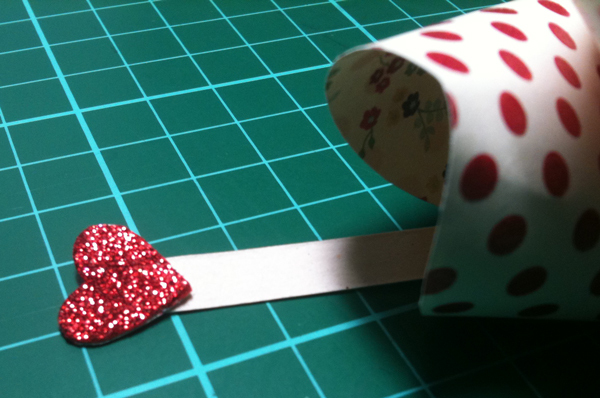 I used the "Poppy Parade" & "First Edition" Speciality DSP combination that I think looks great. I put in lots of lovely "Love Heart" sweeties, well, what else would you put in a Valentine's treat box?? I know, I know, diamonds would be better, but I did add a rhinestone jewel to the heart, unfortunately that's the best I can do. 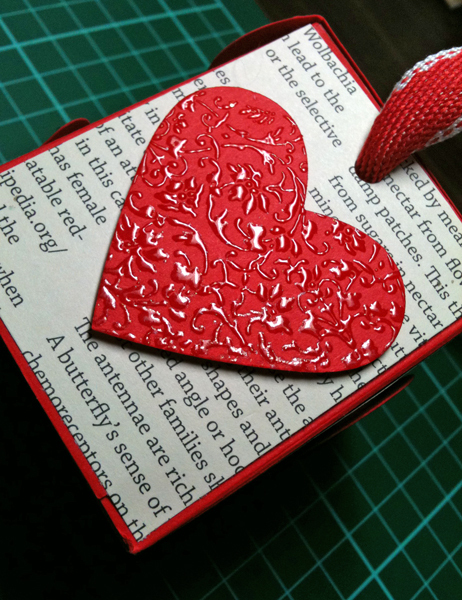 Side view with heat embossed large heart. 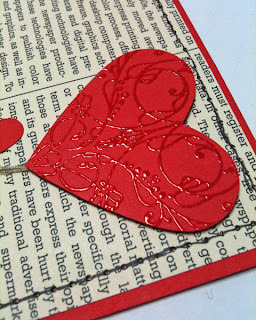 I added two sizes of heart on this project and used the "Heart to Heart" punch and the "Full Heart" punches. I used VersaMark ink to stamp on the floral image from the "Clearly for You" stamp set and heat embossed using clear embossing powder. As you can see from the above picture, the box is quite roomy inside, so you can be quite generous with the amount of treats you put inside. Hope you like it, remember, if you would like to learn how to make a treat box like this or any of the projects that I share whilst staying in the comfort of your own home, then get in contact and arrange a workshop for you and your friends, who knows what you could find yourself creating! 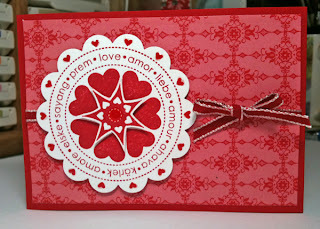 Stamp Sets : "Clearly for You"
Card stock : "Poppy Parade"
Accessories : Clear Embossing powder; "First Edition" Speciality DSP; "Poppy Parade" Stitched-Poly ribbon; Rhinestone jewels & Window sheets. Colour : VersaMark ink pad. Also: Velcro from my local art supply shop. Very late in posting as I've had a migraine today and it can knock me for six whilst I'm waiting for it to wear off, luckily I only get them once or twice a year so I can't complain. I wanted to post as I am starting a new series called "Monday CASE'd booked". This is going to be a regular series where I CASE a project that I've seen either in catalogue or on a YouTube video. 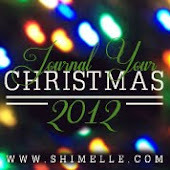 My share today is something I CASE'd from the Catalogue, it can be found on Pg 124. Making this came in handy as I needed a card for my niece, Sandra, whose birthday it was last week and I wanted something quite pretty and girlie. I then made another one, but just turned it round and changed a couple of things. 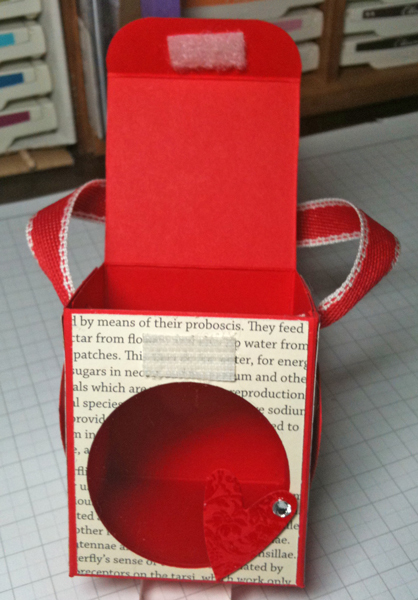 I think CASE'ing projects is a great way to get your creative juices flowing if you've lost your crafty mojo, you just need to make sure you give due credit to whoever or where ever inspired you. 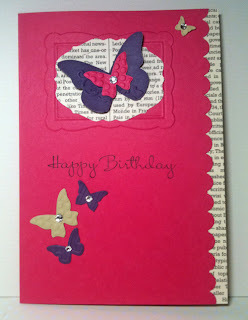 Card stock : "Rose Red"; "Concord Crush"; & "River Rock"
Tools : "SNAIL" adhesive; Glue dots; Heat tool; Big Shot Machine; "Beautiful Wings" Embossslit Die; "Scallop Trim" border punch; "Scallop" border punch & "Designer Frames" Textured impressions embossing folders. Well, I can't find the photo's for the project I wanted to show you, so I will share this one with you instead. As you can see, it's another card, but this time a full sized A6 card. I used "Poppy Parade" cardstock and the "First Edition" DSP, which I think work wonderfully together. 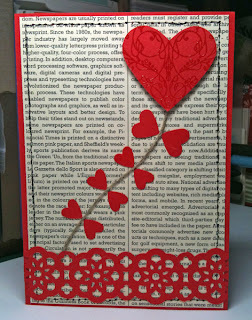 I used the heart punches to create a 'kite' effect, with the linen thread as the kite string. I heat embossed the image from the "Always Elegant" stamp set onto the cardstock before using the large heart punch so that I could get a symmetrical image on the heart. I used the mat pack and the paper piecing tool to put holes all around the card and used a black marker to make the faux stitching. I really like this card, hope you do too. Stamp Sets : "Always Elegant"
Accessories : Clear Embossing poweder; "First Edition" Speciality DSP & Linen thread. Colour : VersaMark ink pads & "Baisc Black" marker pen. 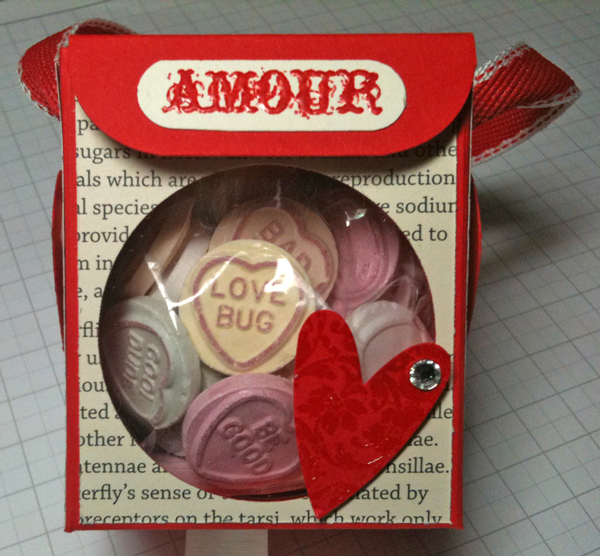 Tools : "SNAIL" adhesive; Dimensional Adhesive; "Full Heart" punch; "Small Heart" punch; "Heart to heart" punch;"lace Ribbon" border punch; Mat pack & Piercing tool. 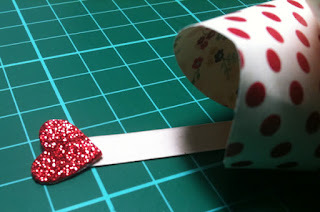 I'm going to share two projects with you today as I wasn't able to get online yesterday, the first is a little A7 size card, perfect for sneeking into a pocket or lunchbox. 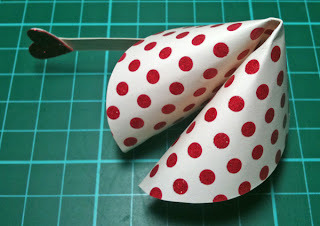 I made the decorative corners with my small heart punch, it just adds a little detail rather than the plain corners or using the corner rounder, which gets a bit 'same old, same old' after a while. Anyway, I'll be back it a bit with another post, just have to quickly sort out the photo's. 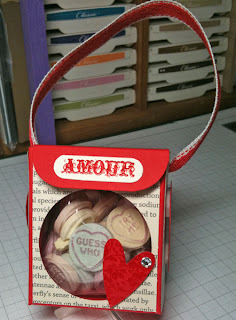 My Valentine's project today is a little different as it's a Valentine Fortune Cookie. This "Fortune Cookie" is calorie free, but that doesn't mean it isn't jammed packed full lovely sweetness. .. and like all Valentine's projects it's got just the right amount of red and shiny sparkle. Stamp Sets : "Happiest Birthday Wishes"
Card stock : "Naturals Ivory"